This survey and research report discusses shifts in the data management landscape and the movement to align data with operational and analytical workloads creating the best possible unified data architecture platform. The survey identifies key trends surrounding the adoption, expectations, and challenges connected with big data. 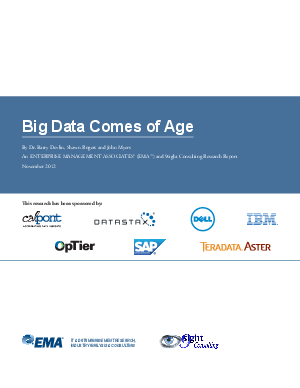 The EMA/9sight Big Data online survey was comprised of 255 Business Intelligence (BI) and data management professionals. The survey instrument was designed to identify key trends surrounding the adoption, expectations and challenges connected to Big Data.